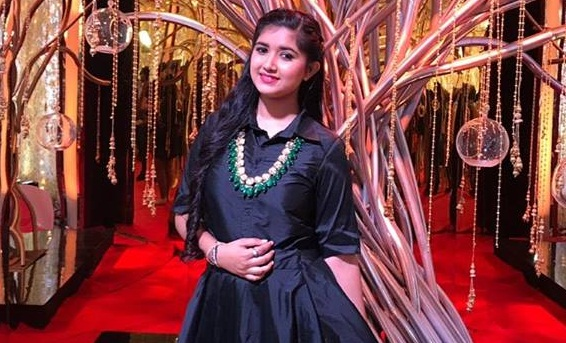 Ishita Vishwakarma, became the winner of ‘Sa Re Ga Ma Pa 2018’, Zee TV’s singing reality show at the age of 16. She received a cash price of Rs. 5 lakhs, a brand new car and a coveted trophy for being the winner of the show. She has become the winner beating her rivals Tanmay Chaturvedi, Sahil Solanki, Aishwarya Pandit, Aslam Abdul Majeed and Sonu Gill. Sonu Gill and Tanmay Chaturvedi became the first and second runner-ups of the show. Here are some less known facts about the winner teenage girl singer, Ishita Vishwakarma. 1. Ishita is a girl from Jabalpur (Madhya Pradesh, and is currently a Kendriya Vidyalaya student. 2. She is born to couple Anjani and Tejal Vishwakarma. Her mother Tejal is her first guru. 3. Her mother also participated in the auditions with her and was also selected to the mega auditions with her. However, from the mega auditions, her mother Tejal, couldn’t make it to the Top 15 and thus got eliminated. 4. She was not a new singing face to the television viewers while she appeared in Sa re ga ma pa show. She has participated in reality shows Sa Re Ga Ma Pa Little champs 6 (the junior version Sa Re Ga Ma Pa), Sangeet Samrat and Dil Hai Hindustani earlier. 5. Not only she has sung in languages Hindi, Gujarati and Marathi but also proved she is good as well in singing these languages. 6. She worked as the brand ambassador of ‘Lado Abhiyan’, an initiative launched by Madhya Pradesh State government. She works and speaks for the cause of girl education and also against discrimination of girl child through her live converts and nukkad nataks. 7. The sixteen year old Jabalpur girl is also the youngest ever winner of Sa Re Ga Ma Pa.
8. The Bollywood actress Sara Ai Khan who once visited the show, called her mother on the phone to make her hear Ishita’s singing.